I Think I Have . 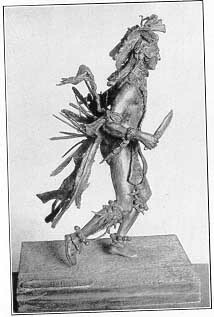 . .
Indian Dancer, a bronze by Austrian artist Karl Kauba, was sold with a forged Remington signature during Eva Remington's lifetime. With some research, you can educate yourself about Remington's art, and hopefully avoid paying too much for something out of optimism. You can see over 3,000 signed Remington paintings and drawings in Frederic Remington: A Catalogue Raisonné by Peter Hassrick and Melissa Webster, Buffalo Bill Historical Center, 1996. For bronzes, consult Icons of the West: Frederic Remington's Sculpture by Michael Greenbaum, Frederic Remington Art Museum, 1996. For prints, which are of interest to many, though not Remington originals, consult Frederic Remington: The Complete Prints by Peggy and Harold Samuels, 1990. Consulting the books above will help you to avoid high hopes for a "Remington" seascape you may have found, or a bronze depicting a bear. For almost a century the market has been seemingly flooded with Remington merchandise ranging from knickknacks, to reproductions to forgeries. 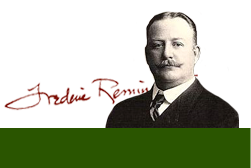 As early as 1911, less than two years after Frederic Remington's death, his widow, Eva, railed against a famous forgery. Someone was making casts of a sculpture, Indian Dancer, by the Austrian artist Karl Kauba, with Frederic Remington's name inscribed on them. This is a quote from Eva Remington's diary, September 27, 1911: "Mr. Pell gave me a photograph of the Indian dancing which was probably done abroad & signed with Frederic's name on it. I will put it in George's hands and let him serve an injunction against their sale. Was tired when I got home." Now you can buy "Remington" bronzes that Remington never dreamed of creating. Some examples are, Double Trouble, The Bear, The Vigil, Broncho Saddle, The Scout, Arizona Cowboy, Calling the Buffalo, and The Warrior. Needless to say, these bronzes are all listed as signed. The profusion of Remington bronze reproductions - and confusion about them - is demoralizingly great. Some older products are belt buckles, medallions and plaques, Jim Beam bottles with matching glasses, all bearing pictures of Remington paintings. You can buy Remington art etched on glass, art as jigsaw puzzles and even A Dash for the Timber cowboy boots. Some more recent products are lamps, bookends and more belt buckles. Do you think you have a Remington? Submit your images.